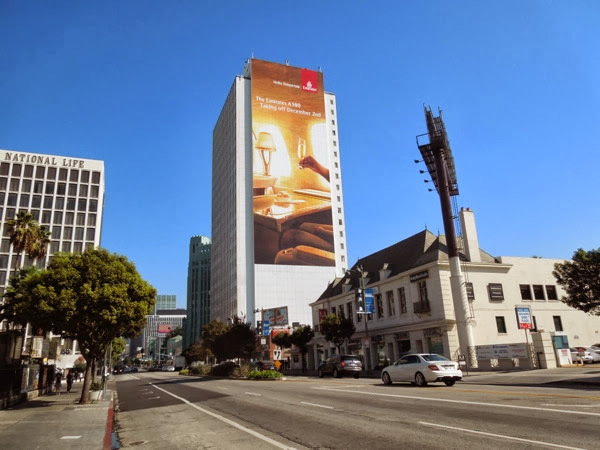 You should all know by now that Daily Billboard is a sucker for a giant-sized billboard, and this impressive ad location along Wilshire Boulevard often has the most eye-catching ads in town. 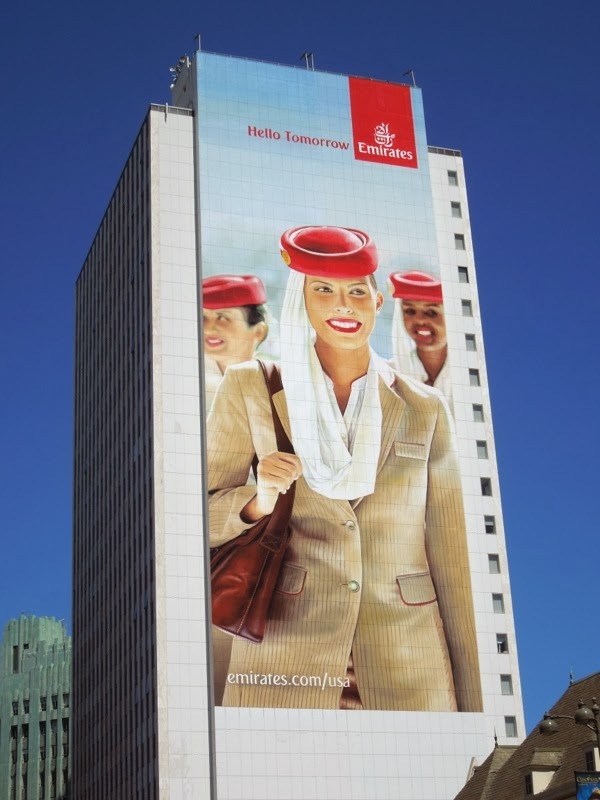 Theses two arresting super-sized billboards are for the premium Emirates Airlines, which apparently won Airline of the Year in 2013 for its outstanding four-star service. 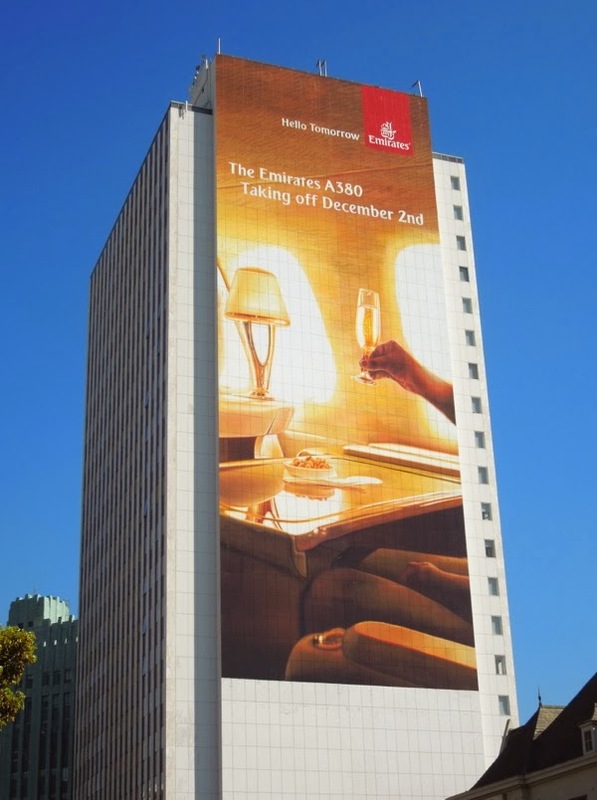 The luxury airline will also be upgrading its Los Angeles-Dubai service to the A380 Airbus from December 2, 2013, so if you want to travel in style in a private suites, enjoy flat-bed massage seats and shower spas 40,000 feet above the clouds, now's your chance to indulge yourself (or get your company to pay for you to travel at least). 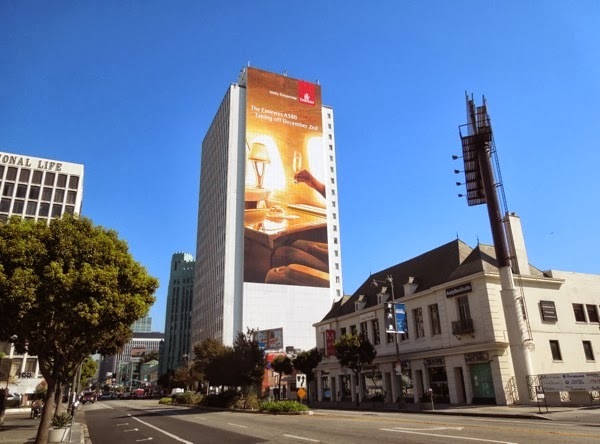 The giant cabin crew billboard was snapped along Wilshire Boulevard last year on June 24, 2012, whilst the new A380 champagne creative was photographed on October 18, 2013. 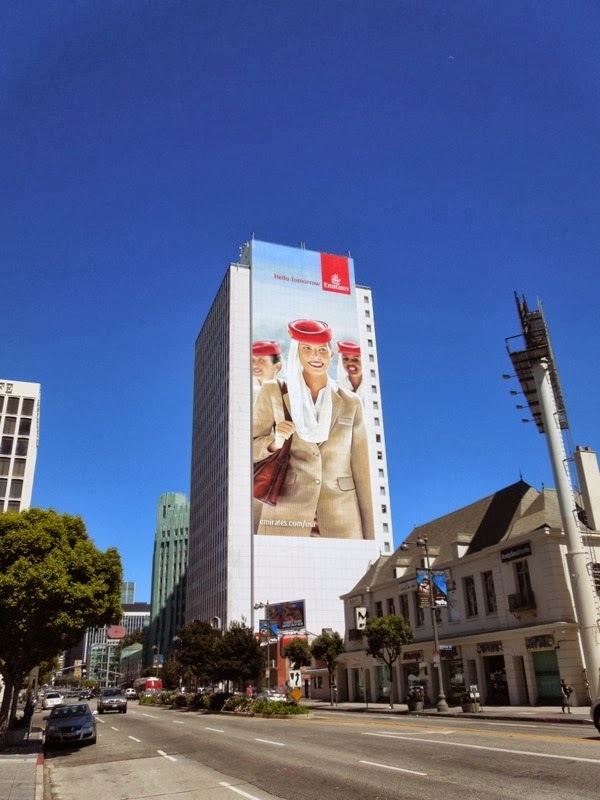 Obviously not everyone can afford to travel the same way, so be sure to also check out these Virgin America billboards for another approach to airline advertising. 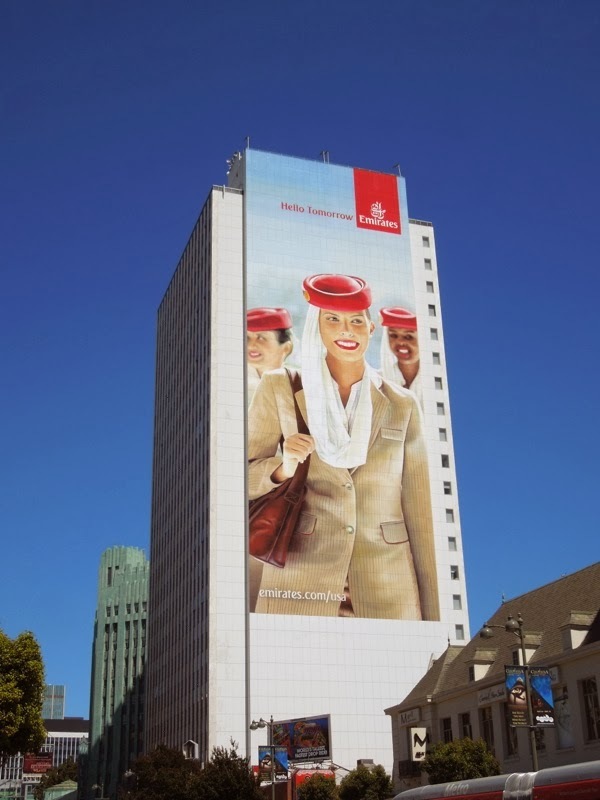 Plus don't forget to take a look at Daily Billboard's 'Travel' category for even more travel and tourism ad campaigns. 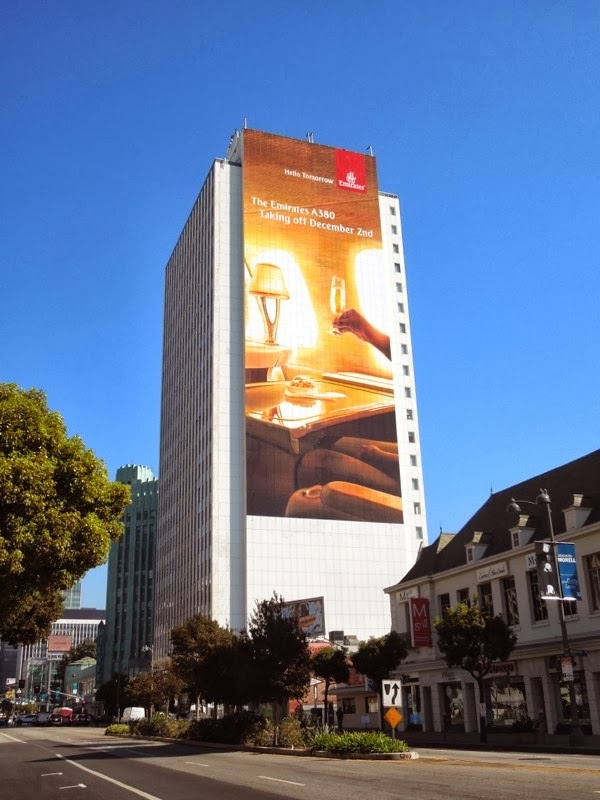 Are you ready for lift off, as Daily Billboard certainly feels like getting away from it all with champagne glass in hand. 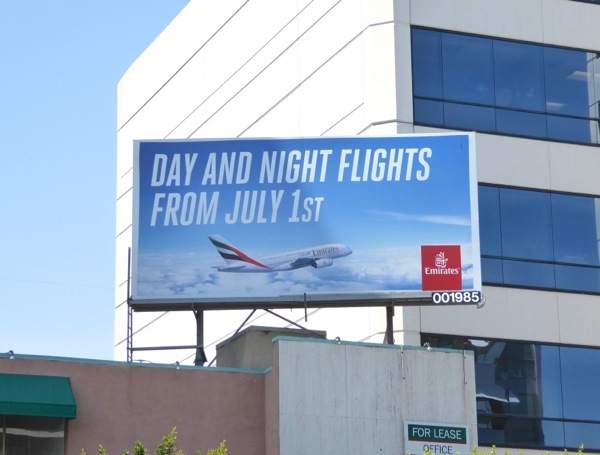 UPDATED: Years later and here's another much smaller billboard for Emirates advertising their day and night flights from L.A., snapped along Wilshire Boulevard on June 22, 2016.